Truepera radiovictrix Albuquerque et al. 2005 is the type species of the genus Truepera within the phylum “Deinococcus/Thermus”. T. radiovictrix is of special interest not only because of its isolated phylogenetic location in the order Deinococcales, but also because of its ability to grow under multiple extreme conditions in alkaline, moderately saline, and high temperature habitats. Of particular interest is the fact that, T. radiovictrix is also remarkably resistant to ionizing radiation, a feature it shares with members of the genus Deinococcus. This is the first completed genome sequence of a member of the family Trueperaceae and the fourth type strain genome sequence from a member of the order Deinococcales. 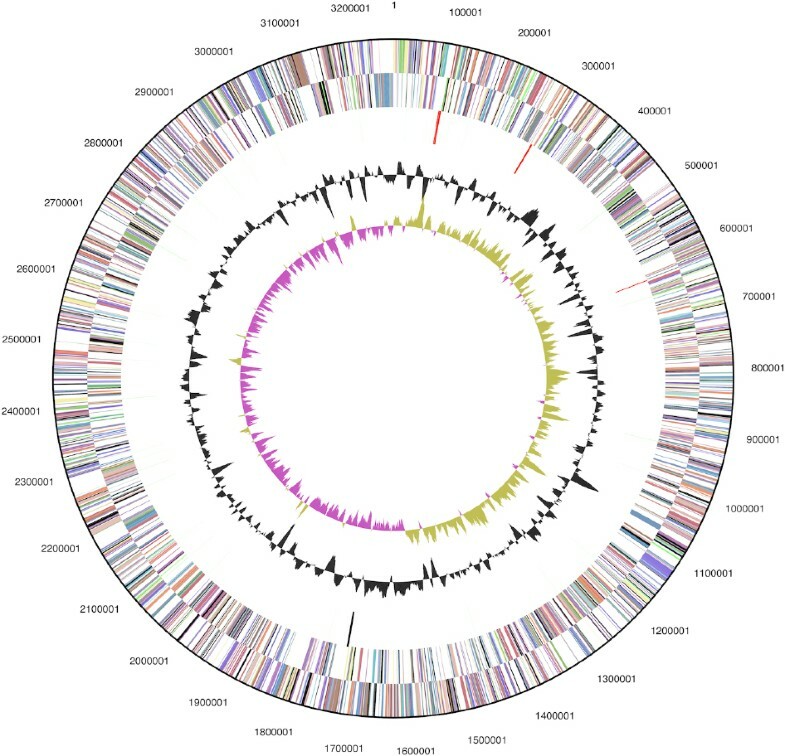 The 3,260,398 bp long genome with its 2,994 protein-coding and 52 RNA genes consists of one circular chromosome and is a part of the Genomic Encyclopedia of Bacteria and Archaea project. Strain RQ-24T (= DSM 17093 = LMG 22925 = CIP 108686) is the type strain of Truepera radiovictrix which is the sole and type species of the genus Truepera [1,2]. The generic name of strain RQ-24T derives from the name “Trüper”, in honor of the German microbiologist Hans G. Trüper. The species epithet is derived from the Latin radiovictrix, the vanquisher of radiation . Strain RQ-24T was isolated in 2005 from a hot spring within a geothermal area located along an almost vertical wall and dry bed of the stream Ribeira Quente, about 500m south-east of a geothermal area on the eastern edge of the town Furnas, Azores . Close to the area where RQ-24T was isolated an accompanying isolate, strain TU-8, was also obtained . Strains RQ-24T and TU-8 share most physiological features as well as identical 16S rRNA sequence. The two T. radiovictrix strains also share many chemotaxonomic and physiological characteristics with the members of the genus Deinococcus, including the extreme resistance to ionizing radiation. Here we present a summary classification and a set of features for T. radiovictrix RQ-24T, together with the description of the complete genomic sequencing and annotation. Figure 1 shows the phylogenetic neighborhood of strain RQ-24T in a 16S rRNA based tree. The sequences of the two 16S rRNA gene copies in the genome differ from each other by four nucleotides, and differ by up to three nucleotides from the previously published 16S rRNA sequence (DQ022076), which contains one ambiguous base call. Phylogenetic tree highlighting the position of T. radiovictrix relative to the type strains of the other species within the class ‘Deinococci’. The tree was inferred from 1,457 aligned characters [3,4] of the 16S rRNA gene sequence under the maximum likelihood criterion  and rooted in accordance with the current taxonomy. The branches are scaled in terms of the expected number of substitutions per site. Numbers above branches are support values from 1,000 bootstrap replicates  if larger than 60%. Lineages with type strain genome sequencing projects registered in GOLD  are shown in blue, publicly available complete genome sequences [CP002361, Oceanithermus profundus] and published genomes [8–11] in bold. The genome of D. radidurans published by White et al. in 1999  later turned out to be not from the type strain . A representative genomic 16S rRNA sequence of strain RQ-2T was compared using NCBI BLAST under default settings (e.g., considering only the high-scoring segment pairs (HSPs) from the best 250 hits) with the most recent release of the Greengenes database  and the relative frequencies, weighted by BLAST scores, of taxa and keywords (reduced to their stem ) were determined. 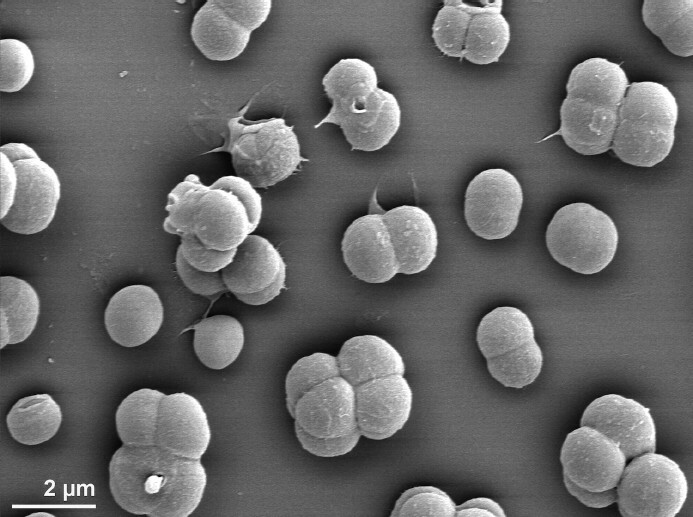 The five most frequent genera were Deinococcus (84.0%), Truepera (8.0%), Oceanithermus (6.3%), Thiocapsa (0.9%) and Thiobaca (0.8%) (98 hits in total). Regarding the two hits to sequences from members of the species, the average identity within HSPs was 99.7%, whereas the average coverage by HSPs was 97.6%. Among all other species, the one yielding the highest score was O. profundus, which corresponded to an identity of 87.5% and an HSP coverage of 61.9%. The highest-scoring environmental sequence was EU924247 (‘Microbiology and geochemistry Little Hot Creek hot spring sediment temperature 80 degrees C clone LHC1 L4 D07’), which showed an identity of 96.6% and an HSP coverage of 91.4%. The five most frequent keywords within the labels of environmental samples which yielded hits were ‘rock’ (3.1%), ‘microbi’ (2.9%), ‘skin’ (2.1%), ‘soil’ (1.9%) and ‘air’ (1.6%) (152 hits in total). The five most frequent keywords within the labels of environmental samples which yielded hits of a higher score than the highest scoring species were ‘rock’ (4.2%), ‘microbi’ (2.7%), ‘air’ (2.4%), ‘soil’ (2.1%) and ‘cabin/commerci’ (2.0%) (60 hits in total), indicating the existence of close relatives of the strain also in less extreme habitats. The non-motile, red-pigmented cells of RQ-24T are spherical and approximately 1.25–2.0 µm in diameter, forming predominantly pairs or tetrads (Figure 2 and Table 1). Ultrathin sections of the cytoplasm revealed ribosomes, a fibrillar nucleoid and tubular structures of unknown nature, as well as three distinct layers of the cell wall, the innermost layer being thin, the outermost layer being as thick as 20–90 nm, both being electron dense . Strain RQ-24T grows best at around 50°C, but not at 20°C or 60°C, with 1.0% NaCl in Thermus medium or Degryse medium 162. The acceptable salinity range supporting growth is up to 6.0% NaCl. Optimum pH is 7.5–9.5, with growth detected up to pH 11.2, but no growth was detected at pH 6.0 . Strains RQ-24T and TU-8 are the most alkaliphilic members of the phylum “Deinococcus/Thermus” . Both strains are oxidase and catalase positive and use a wide range of carbohydrates, organic acids or amino acids as carbon and energy sources with a respiratory metabolism (Table 1). Unexpectedly, strains RQ-24T and TU-8 are capable of fermenting glucose to lactate via homolactic fermentation . Also, both strains are extremely resistant to gamma irradiation, with 60% survival rate after exposure to 5.0 kGy . They share this radiation resistance trait with strains from the genus Deinococcus, Kineococcus radiotolerans and the actinobacterial genus Rubrobacter . Classification and general features of T. radiovictrix RQ-24T according to the MIGS recommendations . All attempts to identify a peptidoglycan of strain RQ-24T failed . The polar lipids comprised as complex mixture of glycolipids and phospholipids, although no attempt has been made to compare them with the characteristic compounds found in members of the orders Deinococcales or Thermales. The major respiratory quinone is menaquinone 8 (MK-8). The fatty acids are predominantly saturated branched acids of which anteiso-C15:0 (38.6%), anteiso-C17 (17.2%) and iso-C17:0 (16.6%) as well as iso-C16:0 (6.9%). One acyl compound has an equivalent chain length (ECL) consistent with iso-C18:0 1,2-diol and another compound with ECL 16.090 probably representing iso-C15:0 diol. 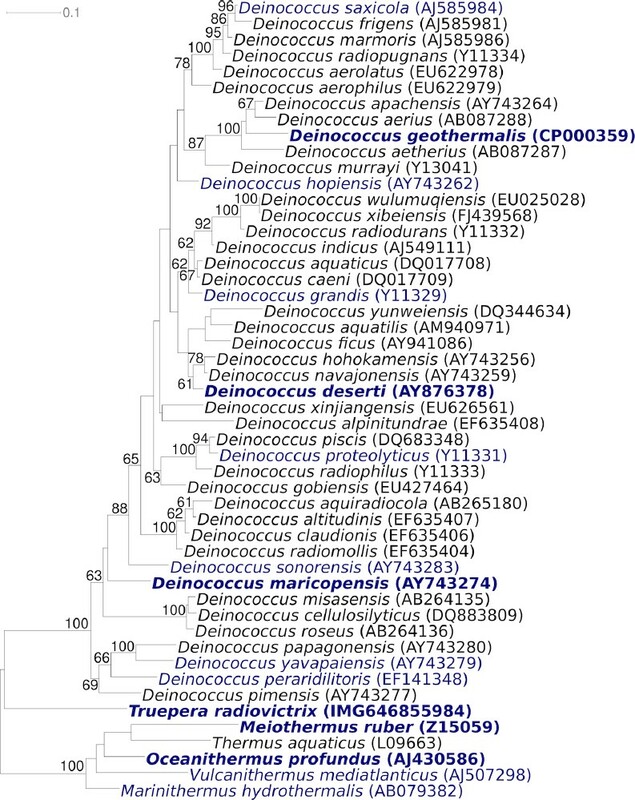 The presence of the long-chain 1,2 diols is unknown in members of the genus Deinococcus (although the methods normally used would not identify them), while they are found in some other members of the genera Thermus and Meiothermus. Despite the fact that members of the species T. radiovictrix is described as being red pigmented there is no data on the nature of the pigments. T. radiovictrix RQ-24T, DSM 17093, was grown in DSMZ medium 1033 (Thermus Medium)  at 50°C. DNA was isolated from 0.5–1 g of cell paste using MasterPure Gram-positive DNA purification kit (Epicentre MGP04100) following the standard protocol as recommended by the manufacturer, with modification st/LALM for cell lysis as described in Wu et al. . DNA of strain RQ-24T is available through the DNA Bank Network [29,30]. The genome was sequenced using a combination of Illumina and 454 sequencing platforms. All general aspects of library construction and sequencing can be found at the JGI website . Pyrosequencing reads were assembled using the Newbler assembler version 2.1-PreRelease-4-28-2009-gcc-3.4.6-threads (Roche). The initial Newbler assembly consisting of 75 contigs in five scaffolds was converted into a phrap  assembly by making fake reads from the consensus, to collect the read pairs in the 454 paired end library. Illumina GAii sequencing data (230.2 Mb) was assembled with Velvet  and the consensus sequences were shredded into 1.5 kb overlapped fake reads and assembled together with the 454 data. The 454 draft assembly was based on 268.9 Mb 454 draft data and all of the 454 paired end data. Newbler parameters are -consed -a 50 -l 350 -g -m -ml 20. The Phred/Phrap/Consed software package  was used for sequence assembly and quality assessment in the subsequent finishing process. After the shotgun stage, reads were assembled with parallel phrap (High Performance Software, LLC). Possible mis-assemblies were corrected with gapResolution , Dupfinisher, or sequencing cloned bridging PCR fragments with subcloning or transposon bombing (Epicentre Biotechnologies, Madison, WI) . Gaps between contigs were closed by editing in Consed, by PCR and by Bubble PCR primer walks (J.-F.Chang, unpublished). A total of 336 additional reactions were necessary to close gaps and to raise the quality of the finished sequence. Illumina reads were also used to correct potential base errors and increase consensus quality using a software Polisher developed at JGI . The error rate of the completed genome sequence is less than 1 in 100,000. Together, the combination of the Illumina and 454 sequencing platforms provided 153.1 × coverage of the genome. The final assembly contained 736,380 pyrosequence and 6,393,275 Illumina reads. The genome consists of a 3,260,398 bp long chromosome with a G+C content of 68.1% (Table 3 and Figure 3). Of the 3,046 genes predicted, 2,994 were protein-coding genes, and 52 RNAs; 49 pseudogenes were also identified. The majority of the protein-coding genes (73.4%) were assigned with a putative function while the remaining ones were annotated as hypothetical proteins. The distribution of genes into COGs functional categories is presented in Table 4. We would like to gratefully acknowledge the help of Helga Pomrenke (DSMZ) for growing T. radiovictrix cultures. This work was performed under the auspices of the US Department of Energy Office of Science, Biological and Environmental Research Program, and by the University of California, Lawrence Berkeley National Laboratory under contract No. DE-AC02-05CH11231, Lawrence Livermore National Laboratory under Contract No. DE-AC52-07NA27344, and Los Alamos National Laboratory under contract No. DE-AC02-06NA25396, UT-Battelle and Oak Ridge National Laboratory under contract DE-AC05-00OR22725, as well as German Research Foundation (DFG) INST 599/1-2.